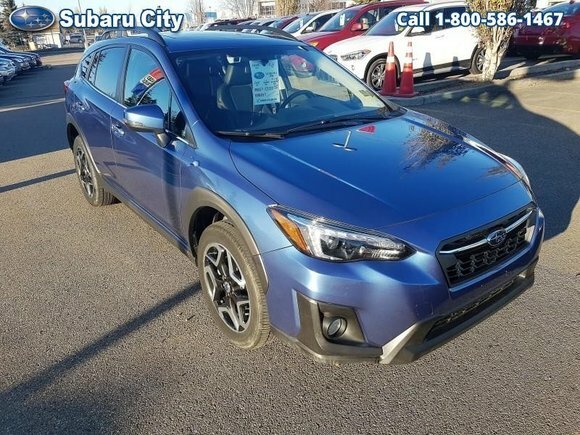 Home > Used Vehicles > 2018 Subaru Crosstrek Limited CVT w/Eyesight,AWD,SUNROOF,NAVIGATION, HEATED SEATS AND STEERING WHEEL, HEATED WIPERS,BLUETOOTH,BACK UP CAMERA!!! 2018 Subaru Crosstrek Limited CVT w/Eyesight,AWD,SUNROOF,NAVIGATION, HEATED SEATS AND STEERING WHEEL, HEATED WIPERS,BLUETOOTH,BACK UP CAMERA!!! The 2018 Subaru Crosstrek is all-new from the ground up, inside and out and from top to bottom. The changes include a new platform with a new suspension system, a new Subaru BOXER engine and a new transmissions. The exterior has been redesigned that allows for a more spacious and comfortable cabin. With the value-packed Crosstrek, you have all the benefits of a true crossover that includes generous ground clearance, ample cargo space and excellent versatility, dare we say the perfect package? This wagon has 18311 kms. It's quartz blue pearl in colour and is completely accident free based on the CARFAX Report. It has an automatic transmission and is powered by a 2.0L H4 16V GDI DOHC engine. This vehicle has been upgraded with the following features: Navigation, Leather Seats, Sunroof, Blind Spot Detection, Eyesight, Led Headlights, Heated Seats. It has some remaining factory warranty for added peace of mind.